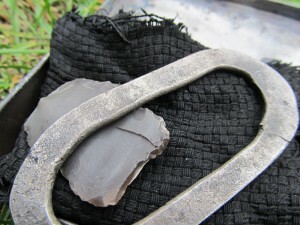 When you’re lighting a fire with a flint and steel or other striker that makes fire from sparks, char cloth is your friend. Char cloth can make the difference between getting a fire started and just throwing sparks around. 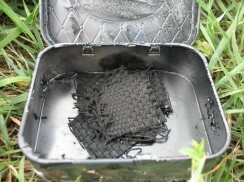 Char cloth is blackened fabric that catches a spark, starts burning, and won’t blow out until it’s burned out. It works kind of like charcoal, but it burns faster and it’s far easier to light. 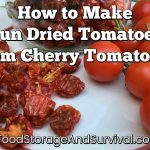 You want some in your fire starting supplies, and it is super easy to make, so let’s get started. 100% cotton fabric. The looser weave the better. Jersey t-shirt material will work, but it doesn’t catch spark as well as terry (towel material) or my favorite, monk’s cloth (I purchased mine at Wal-Mart). You can use your old towels for this project as long as they are 100% cotton. I’ve heard that any natural fiber fabric would work (silk, linen, hemp, etc. ), but haven’t tried any except cotton. Polyester, rayon, spandex and the like are not natural fibers. Don’t use those. Can for cooking the fabric. 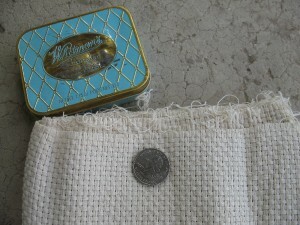 I used an old chocolate sampler can–similar to an altoids can. You can also use a cleaned out vegetable can with foil for a lid or a little larger container like the holiday cookie tins. Punch an air hole in the lid of your can for the smoke to escape. Heat source. I like a fire. It’s cheap and fast. You can also use a camp stove or your gas grill or other similar cooking device. Step 1: Cut your fabric. You can cut it into large pieces that you can tear apart after they’re charred, or cut it into little individual serving size squares (about 1 1/2 inches square is plenty). Step 2: Place the fabric in the can and close the lid. Don’t pack it too tightly–you want air circulation in the can. That tin of fabric is in there somewhere . . . Step 3: Cook the can of fabric on your heat source. I was told to cook it until it stops smoking, but that can be kind of hard to determine in a fire pit. This is really best done outside–the burning fabric doesn’t smell all that good. Generally 15 minutes or so should be plenty. If it’s taking longer to get fully blackened and be able to break easily, you may have too much fabric stuffed in your can. There’s nothing wrong with leaving that can in the fire until the whole fire burns out, but 15 minutes should be sufficient to char your cloth. Step 4: Let the char cloth cool. It is now ready to use or pack carefully in your fire starting supplies. Finished char cloth is fairly fragile–it tears and breaks much easier than uncooked fabric, so you may want to put it in a protective container rather than just a baggie tossed in your kit. That’s not too hard, right? To use your char cloth, place it where a spark will land on it from your striking tool. Use the lit char cloth to light your other tinder and get your fire going. I don’t get it. I need some science to back up why use char cloth and not just regular cloth. But, at least I know how to make it…lol. I am not saying you are wrong at all. It all just puzzles me. I like to know the science behind a thing. If you try throwing sparks on regular cloth, you can actually send quite a few sparks onto the fabric before one catches it on fire. 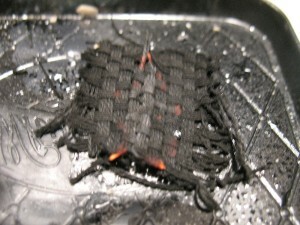 The char cloth is just a lot more sensitive to catching fire than non-charred fabric. The cloth is turned into carbon. The more carbon processing in a material the easier it catches. This is not as carbonized as gasoline, but the principal is the same. This is also why a candle wick takes a few seconds to light the first time, but lights quickly after that. Thanks for the candle wick example. And, for the explanation about carbon. That removes the mystery! Monk’s cloth looks like burlap to me. But, I will try WM. Often the people working there have no idea what they are selling in their own dept, so I will explai the look of it or just search. It is usually with the burlap, canvas, etc.–not stacked with the quilting fabrics. It’s a lot softer than burlap, lighter colored, and a more even weave. I got mine a while ago, so see what you can find. 100% cotton terry works well also–even cheapo bulk-package type wash rags. 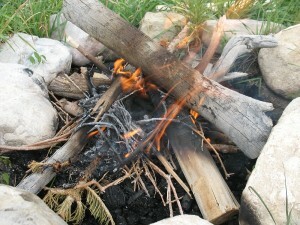 As a Boy Scout some 66 years ago, I made a lot of fires using char cloth made in a coffee can over a fire. It catches the spark from a piece of flint and a chunk of old mill file and the result can be added to some tinder with a puff or two from your lungs. Presto! Fire!